We have had an eventful, busy and enjoyable holiday weekend. There are many posts to write about all of the wonderful things we got to do. But when reviewing the festivities and debating what to write about first I was a bit torn. In the end I decided to forgo some of the personal pictures. I’ve decided to post first on something near and dear to our family’s heart. Community activism. We live in an economically depressed area. Our town is well past the hey days of earlier decades of the 1900’s. Long gone are the resorts that made their money for being a cooler country destination for New York City types in the summer months. I grew up here. In a time that is very similar to now. Decades later not much has changed. People complain. People gripe. People moan. But not many do anything about it. I chose to bring my family back here. To raise my children in small town life, where they have teachers that had their mother (and some even their grandfather). Where people help each other out in small, and sometimes very big, ways. And where my children are part of a history and tapestry interwoven with generations of family and friends. They are not a name on a list read off the first day of school. They are my children, even out and about in our community. When we moved here we made an effort to be involved. To not be on the sidelines yelling at the refs about fouls on the play. We were going to be in the huddle. Doing the work. Getting it done. And if that particular play didn’t work, we would go back and run a different play until we got the goal. So we were overjoyed when a local community group asked us to make a float for the 4th of July festival in town. It was to highlight a great program that is showing family friendly movies in the park every Saturday night. Something that I think gives people something to do and brings the community together. We went about gathering children from other local families and having them dress up as characters from many of the movies being shown in the park this summer. We drove the float down main street in the parade and parents ran beside passing out flyers to everyone in attendance letting them know about this great free program in our community. It was a lot of work. Here in New York it was well over 90 with no cloud cover yesterday. Our kids were not used to this kind of weather, but pulled it off like champs. It was great to see everyone on the float, and everyone on the street, so excited about something positive happening in our small town. 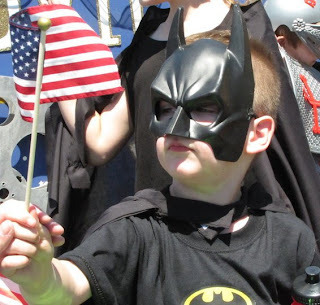 At the close of this 4th of July holiday weekend I celebrate the spirit of the small town American community. May we continue to grow together, even when times are tough! The backdrop for our float. Getting ready for the parade to start! 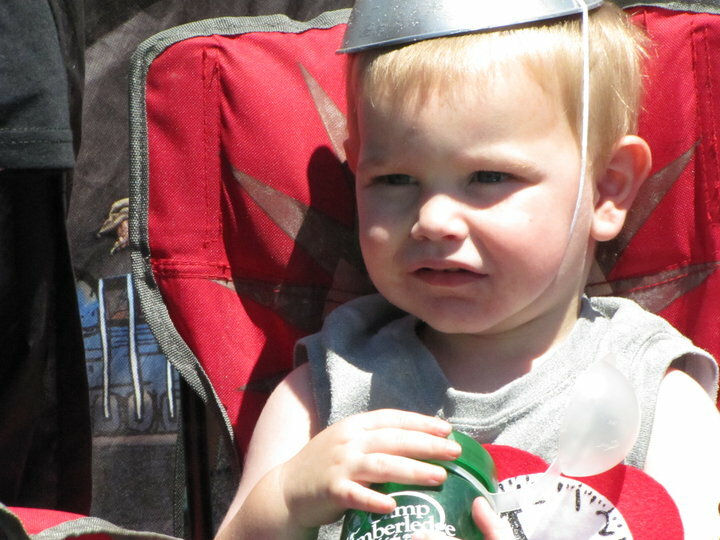 Elis was too cute in his summer Tin Man costume not to have another pic! And an iconic 4th of July pic of Nate as Batman waving the flag!